Patagonia is the world’s first brand to be certified to both the Responsible Wool Standard and the Traceable Down Standard. Patagonia Traceable Down is traced from parent farm to apparel factory to help ensure that the birds that supply it are protected by the strongest animal welfare and consumer assurance standards. These include robust requirements in all areas of the birds’ lives, and especially protects against force-feeding and live-plucking. We began working in 2007 to trace our down supply chain in the interest of sound animal welfare. Since fall 2014, all of the virgin down we use to insulate our products has met our own Patagonia Traceable Down Standard. In our Fall 2017 product season, we went a step further and announced that all our virgin down was also certified to the Global Traceable Down Standard (Global TDS), Advanced certification level by NSF International. In 2018, Patagonia went even further and achieved certification at the brand level, becoming the first outdoor brand to be certified to the Advanced Global Traceable Down Standard. This added level of certification covers our internal product traceability systems as well as our distribution center. This allows certification of not only the down material in our products but the full final product itself. How and why do we do this? Our tracing process starts by auditing the parent farms, where birds are raised to produce eggs. This is where the highest risk for live-plucking occurs, as animals live there up to four years. Even though we don’t get our down from birds at parent farms, we feel obliged to look out for their welfare as they are an essential part of the down supply chain. This is what sets us apart from other brands also concerned about animal welfare. The eggs produced at parent farms are transferred to other farms, where hatchlings are raised for their meat. We audit these farms to ensure sound animal welfare practices. Down is a byproduct of the food industry, and the down we buy comes exclusively from slaughterhouses. After it is collected from geese that have been killed for their meat, we follow it through washing, sorting and processing facilities to ensure proper traceability and segregation from untraceable down. We continue our audits all the way to the garment factory, where we make sure our certified traceable down is stored separately from that of other brands, and used only in our clothing. Audits then continue to our distribution center, where the down garments arrive, are checked in, stored and packaged to send out to our customers following the Traceable Down Standard brand requirements. It’s a lot of work. But this is how we help ensure the birds whose down we use in our products have been treated humanely. The assurance of sound animal welfare and full chain of custody inherent in the Global Traceable Down Standard is the result of thousands of hours of work from our executives, designers, material planners, sourcing department, distribution center, suppliers and corporate social responsibility team. It was neither cheap nor easy, and we had to reexamine our strategy and business operations in the process. But building a long-lasting product that helps you stay warm in good conscience is a legacy of which we are extremely proud. Since our last update we have worked diligently toward obtaining the next level of Traceable Down Standard certification for our own distribution center. This is taking the TDS certification and chain of custody due diligence a step past our garment factories to our warehouse where we ship products to our customers. We are happy to announce that we have reached that goal and are now the first outdoor brand to be certified to the Advanced Global Traceable Down Standard. The audit included a deep look into our own internal traceability systems, not just those of our suppliers. Now our TDS certification covers both the down material and the full final product itself. The assurance of sound animal welfare and full chain of custody inherent in the Advanced Global TDS is the result of thousands of hours of work from our executives, designers, material planners, sourcing department, distribution center, suppliers and corporate social responsibility team. It was neither cheap nor easy, and we had to reexamine our strategy and business operations in the process. But building a long-lasting product that helps you stay warm in good conscience is a legacy of which we are extremely proud. The Advanced certification level means our down suppliers conducted audits all the way back to the parent farms to ensure there was no live-plucking and that broader humane animal welfare standards were faithfully observed throughout the supply chain. (Most brands do not do this.) To offer certified assurance, we had to begin the audit process a calendar year earlier, in late spring 2016, because that is when the geese raising began. Any brand or down supplier can get certified to the Global Traceable Down Standard, either to the “Conformant” level for collector down supply chains or the “Advanced” level for industrial supply chains. And since suppliers own their certification, they can sell certified Global TDS down to all interested customers. This will make it a lot easier for others to source down from birds that were raised humanely, which we’re hoping will lead to better animal-welfare practices industry-wide. Being able to guarantee Advanced Global TDS certified down to our own customers is a huge achievement. We are extremely grateful to NSF International, our suppliers and everyone else who partnered with us to create a best-in-class down supply chain. You can learn more about the Global TDS certification on the NSF International website. Since the launch by NSF International of the publicly available Global TDS in 2015, a lot has happened. In 2016, our entire supply chain—working backward from finished goods factories, to down processors, pre-processors, slaughterhouses, raising farms, hatcheries and parent farms—underwent and passed certification audits to the newly released standard. Certification audits took place at more than 300 entities, spanning six countries. We learned a lot from the experience, including how to adhere to our goal of auditing the entire supply chain, while remaining flexible to the realities on the ground. In 2016, there were outbreaks of highly infectious avian influenza in several countries. We could not ignore the risks of contagion for the animals and the farmers. When visiting the farms, auditors had to follow strict protocols to mitigate spreading the disease that would result in the sacrificing of the animals. Thankfully, the farms that raise the birds that supply us with down were not affected, but this type of event jeopardized our meeting our timeline for certification. We also learned about the impact that unusually hot summers linked to climate change can have on the animals in the supply chain, and on the businesses that depend on them. It is now more important than ever to consider animal welfare. Lastly, we learned that tracing back to and auditing the parent farm in such a large supply chain is challenging, it is far from impossible. We hope that other brands see this and also begin taking this important extra step to ensure parent geese are not live-plucked. Everything we’ve learned we’ve shared with NSF International, which developed and certifies to the Global TDS. They, in turn, have incorporated this information into improving the certification process. Wanting to provide other companies with a similar path forward, one that is both achievable and scalable, in 2014 we asked NSF International to adopt our standard as the basis for a global standard. NSF International is an independent public health organization that works with manufacturers, regulators and consumers to develop standards and certifications that help to protect food, water, consumer products and the environment. We chose to partner with them because their methods and certifications are beyond reproach. Recognizing that not everyone in the down industry would be willing or able to do everything we’ve done to assure animal welfare, NSF International used our standard as a basis for the new Global Traceable Down Standard. NSF International then partnered with down processors, manufacturers, retailers, animal welfare groups, trade associations and other non-governmental organizations to develop the multi-tiered standard that permitted stakeholders various degrees of implementation. All of these entities had a say in defining, refining and agreeing to final criteria. After months of working with stakeholders, in January 2015 NSF launched its NSF Global Traceable Down Certification Standard designed for use by any company. The new certification covers down supply chains, starting at the parent farm and household collector farms, along with down products at the factory level. This milestone marks the completion of one of our commitments to the industry and to our customers to turn our internal down verification program into a global independent certification and provide not only the highest level of animal welfare but also the highest level of transparency into down traceability and animal welfare. Because we recently added new farms, slaughterhouses and processing facilities to our down supply chain, we are re-auditing it to achieve certification. In the meantime, our third-party verified Traceable Down products continue to offer the highest level of assurance for animal welfare in the apparel industry. Once NSF International completes its certification process, you’ll be able to see the certified down supply chain on the NSF International website and on Patagonia’s Footprint Chronicles. As further testimony to the strength of our efforts, Four Paws, the animal welfare organization that once campaigned against our company for buying down taken from birds that were being mistreated, recently released their evaluation of companies in the outdoor industry that used down. They rated Patagonia second in terms of best animal welfare practices. We are continuing our work and hope to be rated number one once our certification process is completed. See Four Paws' Cruelty Free Down Challenge rating. 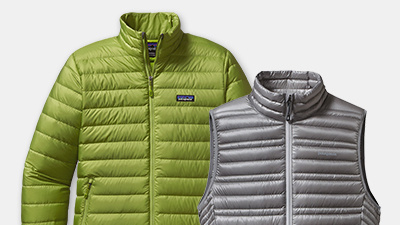 From fall 2014 forward, all Patagonia down products contain only Traceable Down. This means we trace the source of our down from parent farm to apparel factory to help ensure that the birds are not force-fed or live-plucked. The Traceable Down Standard provides the highest assurance of animal welfare in the apparel industry. We began working in 2007 to achieve this, and are the only brand to have done so. To improve down supply chains across the board, we are participating in the formation of an Outdoor Industry Association and Textile Exchange Down Task Force, part of the Materials Traceability Working Group. The goal is to foster collaboration among brands and suppliers to establish traceability standards and methodologies for down products and supply chains. Traceability will allow brands to verify claims about the down used in their products, including whether the geese that supply it have been live-plucked or force-fed. We receive results from the audit in January that show “no evidence of live-plucking or force-feeding practices” in our white goose down supply chain. Furthermore, the audit reveals “a robust traceability document chain, adequate labeling and segregation practices with room for improvement in a few areas.” We are now pursuing remediation of all report recommendations to further improve traceability and animal welfare in our down supply chains. We are also developing a screening process for our down suppliers based on our chain of custody audit and the assessment tools that came out of it. Patagonia has a history of effecting change in supply chains, and we are hopeful to do it with down. In this spirit, as of spring 2013, our entire collection of Ultralight Down clothing uses white down from geese that have been verified by an independent, third-party traceability expert to be non-live-plucked, non-force-fed. It is our hope to expand this offering each season as we build up a Traceable Down supply chain based on our Down Supply Chain Animal Welfare Standard. We commission an independent chain of custody audit of our new white goose down supply chain in Poland, hiring a traceability expert who begins a three-month-long investigation joined by the International Down and Feather League. Our goal is to score down traceability management systems and assess animal welfare. The two are intrinsically linked and equally important to assuring product-content claims. From the moment we started this journey, we knew we needed an independent third-party to help us understand and verify sound animal welfare practices in our down supply chain. To that end, we partnered with traceability experts at Arche Advisors. During the three-month period, auditors assess more than a dozen sites over seven field days, including a down garment factory in China, a down processor in the U.S., and various international down processors, slaughterhouses and farms - including a parent goose farm (where eggs are produced) and a hatchery. The auditors evaluate animal-welfare practices against the August 2012 version of the Patagonia down standard, as well as European Union and individual countries’ laws pertaining to animal welfare. To measure robustness of traceability of the supply chain, our expert looks at the hallmarks of good traceability: documentation trails, physical labeling and segregation of down, and management systems. She then verifies the system’s robustness through the tried-and-true supply chain auditing methodology of document review, observation and worker interviews. We receive reports at each stage of the assessment in each country. They include assessment summaries, analysis of gaps in tracing systems, good practices and a final score for animal welfare and overall traceability management systems. We also receive a final summary report linking all site visits and one final quantitative score for traceability management systems and animal welfare/live-plucking/force-feeding. To our knowledge, no other company has gone to such lengths to assure chain of custody. Wanting to get the facts firsthand, we send our director of social and environmental responsibility, our director of materials development and our strategic environmental materials developer to Hungary to investigate. They make two trips, one in February and one in August, accompanied by principals from our down supplier. The group visits representative links from the entire white and gray goose down supply chains—from parent farms (where the eggs come from) to breeding farms, slaughterhouses to down processors. Existing chain of custody documentation provides good traceability of down from the farm level to the slaughterhouse thanks to Hungarian food industry laws. The chain of custody, however, is not as robust from slaughterhouse to down processors. We begin implementing a plan to improve document linkage and the labeling and separation of our down at all levels of the supply chain, including the garment factories, to ensure that we get no live-plucked material. We also begin looking at other down supply chains where live-plucking and force-feeding of geese is illegal. Our materials team visits Poland to investigate potential new down sources, and we approve one source (that has limited capacity) for use in a range of styles. In December, Four Paws (a German animal welfare group) accuses us of using live-plucked down; a charge we refute. During the controversy, however, we learn from a Four Paws investigation that gray geese from Hungary, where we get our down, are routinely force-fed to produce foie gras. Force-feeding is now banned in many European countries but is still legal in France and Hungary. Aware of the fact that geese do suffer when their down is live-plucked, we require our supplier to certify that all virgin down for Patagonia products comes from slaughterhouses and does not contain any live-plucked down. We’re told that force-fed geese produce an oily, second-quality down that is not being supplied to us, so force-feeding is less of a concern. During an environmental impact assessment of the materials we use, we look at down. We find the global poultry industry (not limited to geese) has a record of inhumane treatment of birds, which are raised for their meat. This includes such things as caging, de-beaking, force-feeding and, on the environmental side, polluting air and water. We ask our down supplier a lot of questions to which they provide detailed answers. But wanting to confirm what they tell us, we send our strategic environmental materials developer to Hungary to visit a goose farm. He asks about living conditions for the geese, what kinds of chemicals the farm uses and how the geese are slaughtered for their meat. Our down supplier assures us our down does not come from geese that are force-fed, which we later find out is untrue. We learn that some of our down is taken from geese after they’ve been killed for their meat, and some is taken from live geese during their molting period. We consult an agricultural professor who says that removing down and feathers from live birds when they’re molting is not painful to the geese. Armed with this information, we attempt to explain the impacts of making a Patagonia Down Sweater on our Footprint Chronicles website.